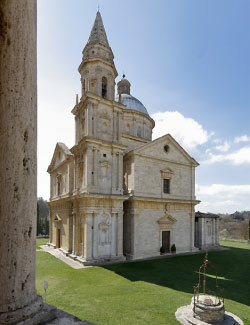 Follow the gourmet food route between Val d'Orcia and Val di Chiana. Arriving at Montepulciano, a village of Etruscan origins where the Renaissance and Middle Ages blend, begin your tasting adventure in the location of a number films with a glass of Nobile wine. Continue towards Pienza, a UNESCO World Heritage Site since 1996, to town of Pope Pius II Piccolomini. Already called Pieve di Corsignano, Pius II reconstructed the town as the ideal location and changed its name to Pienza, in his own honour, and the town is a prime an example of Renaissance architecture. Exiting Pienza in the direction of Amiata you reach the fascinating Castello di Spedaletto and the Oak of Cecche, a monumental tree that is more than 400 years old with a diameter of 4.5 metres.